Caitlyn Winters, daughter of Abby O’Brien Winters Riley, is a woman with a plan for her life. She has always been the serious twin, and a summer as a teen spent volunteering in a doctor’s office in Appalachia was enough to spur her to complete college and medical school in record time. Working with the Red Cross in Africa confirmed her mission to save the world. Everything is on her schedule to completing her pediatric internship at a New York hospital so that she can return to Africa to save the lives of babies in third world countries. Then, Caitlyn catches the bride’s bouquet at the wedding of Jenny Collins, an O’Brien cousin by marriage, to second-chance country music star Caleb Green (A Seaside Christmas), and things started changing. One week after the wedding, she met Noah McIlroy, a resident in family medicine, and soon the two of them were exclusive. Just over a year later, a pregnancy test has just revealed news that jeopardizes all of Caitlin’s plans. Noah McIlroy has dreams too. He is near the end of his residency, and he hopes to set up family practice in a medically underserved area where he can establish a home and become part of the community. He loves Caitlin, and marriage to her is part of his dream. But he also recognizes how important her dream is, and he is willing to do whatever he needs to do to see that Caitlin is happy and that their child has a happy, secure life. When he learns that Chesapeake Shores needs a doctor, he decides it may be the perfect place for him—with or without Caitlin Winters. 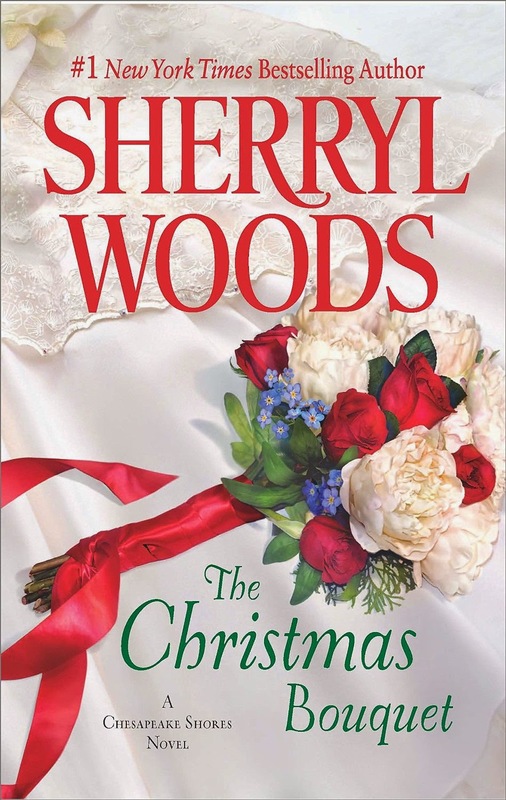 The Christmas Bouquet is #11 in Sherryl Woods’s Chesapeake Shores series, and the fourth Christmas book. I love the O’Briens; I count them among my favorite fictional families. But I have found the later novels in the series somewhat uneven, with my ratings ranging from 3.5 to 5 stars. For example, I loved Jenny and Caleb’s story, the 2013 Christmas tale. In this one, I liked catching glimpses of all the in-progress HEAs from Grandma Nell and her newly discovered old love to Jenny and Caleb. And I adored Noah. He is one of those sweet, nurturing heroes with lots of strength and charm and a high H. Q. (hotness quotient)—and just enough imperfections to keep him from being bland and boring. But Caitlin often came across as whiny and selfish. Her desire to serve children who need her skills is admirable, and I am all in favor of a woman focusing on her own dream. But Caitlin is not a victim here. She was not raped or seduced, and as an educated 21st-century woman, surely she must have known that no reversible method of birth control is fully effective. She is as responsible as Noah for the pregnancy. No one ever suggests that she abandon her dream. Noah, her family, and her mentor all assure her that a delay does not mean the end. She even recognizes this truth herself more than once, but then she reverts to a state of self-pity and frustration that her life is not working out according to her plan. Finally, even though she gives lip service to the idea that decisions concerning the baby should be made jointly by her and Noah, she persists in making choices on her own. Even though the ending brings a wiser, less self-absorbed Caitlin, I couldn’t get past the irritation that had accumulated through the earlier pages. Woods has written over a hundred books, and I have enjoyed many of them. Quite a few found a home on my keeper shelves. Realistically, I know that no author, perhaps particularly the most prolific ones, scores big with every book. I will probably keep reading the Chesapeake Shores series as long as it runs. In fact, I’ve already read an ARC of #12 and consider it a winner. I’m also looking forward to what Hallmark does with the books in the 2015 adaptation of the series. But I did not like The Christmas Bouquet nearly as much as I wanted to. Still, if I had not read it, I would not have met Noah. So, final take: mixed reactions with a hero who stole my heart and a heroine who affected me like fingernails on a chalkboard. Noah and the happy-Christmas-to-all ending make it worth a read. Janga -- it made my heart happy to run across your review tonight! I am also a long-time Sherryl Woods fan and look forward to the Hallmark adaption of the Chesapeake Shores books. I have to admit, Caitlin's whining was enough to make me put down the book. Noah deserved a better heroine. I have several of her books sitting on my TBR mountain. They are among the ones I wish I could get enough tome to read. I had no idea she had so many books in this series. I am going to have to see how close to the beginning of the series my books are. It sounds like THE CHRISTMAS BOUQUET has a few themes I can relate to. To bad Caitlyn sounds like a less than inspiring heroine. The story still sounds like one I will enjoy. Thanks for the review.